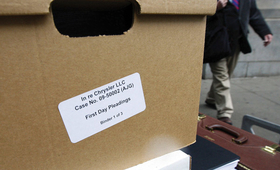 Boxes of documents, thousands of creditors: Can it be a speedy case? DETROIT -- Chrysler LLC says it will use U.S. Chapter 11 bankruptcy reorganization to create a viable new company "in a matter of 30 to 60 days." But bankruptcy experts say that timetable is very optimistic. "One of the dumbest things anybody can do -- government included -- is to predict how long this process will take," says Douglas Bernstein, a lawyer at Plunkett Cooney in suburban Detroit. Dissident creditors could object to plans to sell most Chrysler assets to a new company created by Chrysler's alliance with Fiat S.p.A., he says. Chrysler is proposing to use Section 363 of the bankruptcy code, which allows quick asset sales, to move its brands and other assets to the new company. Sreedhar Bharath, an assistant professor of finance at the University of Michigan, says the sale must be approved by a majority of two-thirds plus one in each creditor class. "If they get the two-thirds plus one, they have the ability to cram this down on the recalcitrant creditors," Bharath says. "If that doesn't work, the creditors have the ability to block the purchase." Daniel Glosband, a partner in the Boston law firm Goodwin Proctor, says dissenting creditors could object to a sale that occurs without the open bidding that Section 363 normally entails. "It's a very rare case that doesn't include exposure to further bidding," he says. "The goal of the process is to maximize the value" that creditors receive from any asset sales. Glosband says a judge has the power to change the assets sold through Section 363 or to accept new bidders.